The Ragnaud-Sauborin family has, in the Cognac region, the two-fold characteristic of being owners and growers and of owning 50 hectares of vineyards in the Grande Champagne region. The Grande Champagne region is the quintessence of the region. A profoundly original soil, a “1er cru” of the Cognac region, the boundaries of which were established according to the decree of May 1, 1909. Cognacs exclusively from the Grande Champagne region are characterized by outstanding qualities. The wood of the new barrels and the bouquet of the initial cognac progressively blend together, revealing floral touches, the very essence of this soil of the Charentes, unique in the world for its creativity. All the Ragnaud-Sauborin cognacs are produced from this very top quality brandy. The growths here are not blended, there is just a single "appellation d'origine". No concessions here, just an unshakeable philosophy since 1850: only produce the best quality, in limited quantities. 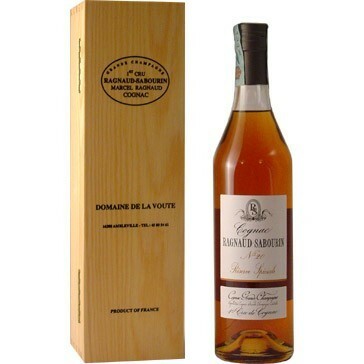 This 20 years aged Reserve Speciale 1er cru Cognac is made from old Grandes Champagnes. The colour is deep golden yellow. At nose it shows balsamic aromas while taste is full and smooth. The grape variety is Ugni blanc. The maturing of tannins lends the Cognac all its fullness and smoothness on the palate. Content: 70 cl Alcohol: 43% vol.